In some applications, going with an economical choice may sacrifice precision, durability or quality. But this is not always the case when it comes to economical platform scales. In the market of platform scales, technologies are evolving and changing, and this is allowing for economical models to be developed without sacrificing efficiency or reliability in the process. There are a number of characteristics that you should look for, in order to ensure that you are purchasing the most efficient scale for your industry. 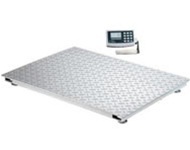 Platform scales need to work correctly for you, in order to be cost effective. If the scale isn’t strong enough to handle your materials, or if it doesn’t weigh accurately enough, then it won’t be an economical choice. Be sure to choose a scale that is suited to your industry, so that you aren’t spending money working around your scale’s shortcomings, or replacing it often. Economical platform scales do not have to be devoid of customization in order to remain economical, now that computerized scale technologies for industrial purposes are evolving. The newest scale technologies have made these devices much more cost effective, which means that better industrial platform scales can be purchased and utilized without sacrificing quality of results in the process. Each weighing application will be different, so whether you are working in the medical field, or weighing the volumes of liquids, your scale should be specifically suited to the task. Durability is also an important consideration when it comes to buying economical platform scales. Durability should never be sacrificed for the sake of economy. When you purchase and utilize durable platform scales, you can rest assured that your scales will stand up against the elements, and will be able to resist general wear and tear over time as well. If your economical platform scale is sacrificing quality and durability for the sake of cost effectiveness, then it likely is not cost effective at all. Maintenance and replacement of a scale can be expensive, so make sure that your scale has the capabilities to handle much more than your typical loads in order to ensure that it will last. One of the most important benchmarks of the durability of a scale is the type of metal that a load sensor is made from. While aluminum and nickel plated steel load sensors are very popular, stainless steel is the best choice, by far. Precision is important in industrial platform scales because it determines how accurate weighing results will be, and to what increments they can measure. The most precise and accurate platform scales can deliver results as small as a fraction of a gram, which is often necessary in certain industries and applications. The newest scale technology, utilizing Surface Acoustic Wave, or SAW sensors, can deliver much higher accuracy levels than other scale technologies. Platform scales should be customizable without sacrificing economy in the process. Purchasing and using customizable platform scales is the best way to ensure that the right results are achieved. As technologies improve in the development of industrial quality platform scales, better materials and more efficient manufacturing make these scales more cost effective all the time. Look for platform scales that utilize the latest technologies without making significant changes to price. Prices do not have to climb simply as technologies change. Compare the features and materials of many different scales, so that you can find one ideally suited to your purposes. Don’t spend money on bells and whistles that you may not need, and don’t skimp on the aspects that are vital to your industry.